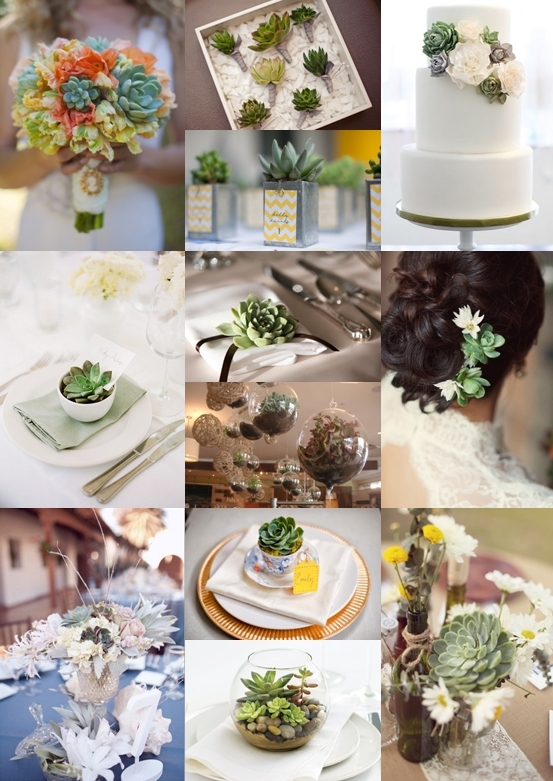 Succulents used with wedding flowers make for an interesting match. Very asymmetrical in size, form and appearance, these plants bring something very different to a wedding floral arrangement. Unique, unusual and very interesting, succulents are very often a real conversation piece with your guests and also make for excellent wedding favors. Slightly unconventional and somewhat unpredictable when used with traditional wedding flowers, succulents are probably best described as subdued but sophisticated, an excellent all-rounder that imprint a subtle and soft, but remarkable difference to you wedding floral arrangements. In some ways the surreptitious second cousin of wedding flowers, these plants have a real propensity to make an innocuous entry, but to have a very effective impact on the appearance of your wedding floral arrangements. Where succulents come into their own in terms of careful design and a creative floral construction is to add bulk and texture, and to amplify and accentuate the wedding flowers, especially the focal wedding flower of choice. 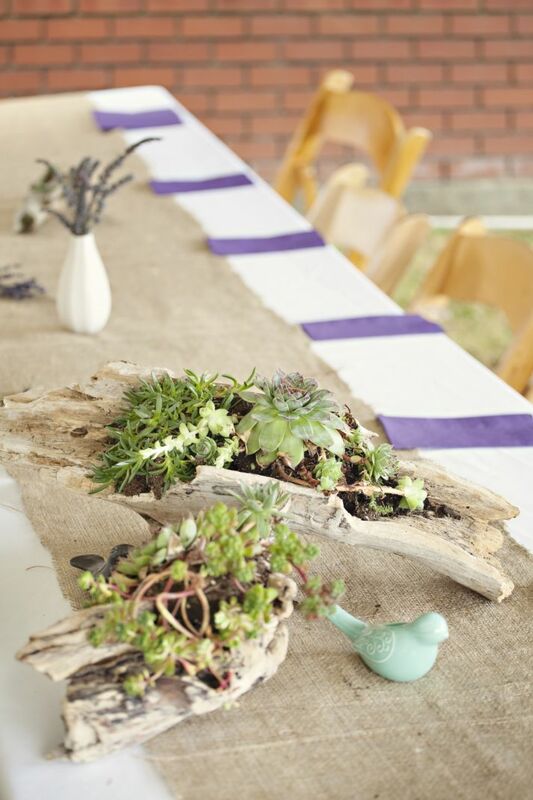 Sometimes described as fat plants, succulents simply add enormous value to wedding floral design. To contribute more greenery to the overall holistic wedding theme, an approach that is particularly effective with brightly colored wedding flowers. To intentionally add additional bulk, texture and volume to the floral designs, and to reduce the overall costs of her wedding floral arrangements. To strive for a unique look to her floral designs using succulents that are available in a diverse range of different shapes and sizes. To use indigenous plants that represent the local vegetation. To leverage maximum benefit of the superior shelf life these drought resistant plants offer compared to freshly cut flowers. These plants are far more robust than their cut flower peers and are tolerant to adverse outdoor conditions that normally would cause fresh cut flowers to prematurely wilt or die off completely. These plants are very effective when used in vintage and rustic wedding environments, especially when potted. They can be set and positioned in the bridal bouquet well in advance, with the addition of accent flowers and the primary flowers taking place just prior to the wedding. To use these arrangement as a favors for the guests to take home with them, a gift which serves as a lasting reminder for the wedding, reinforced by the fact that various of these plants can be very successfully replanted. To take advantage of a large and widely diverse selection. To promote the somewhat esoteric concept of growing and enjoying succulents. Many people love gardening exclusively with succulents. Most of these plants are available locally all year round. To embody the growing global trend to incorporate succulents with wedding flowers when designing the final wedding florals. These plants add a certain quant intrigue to your floral decorations, making for a talking point amongst your guests. If carefully constructed these plants can be used in all types of bouquets and even boutonnieres. As reception flowers they can also be used very effectively as place card holders, favours, horizontal centrepieces and also work well as hair arrangements. Succulents match well with most wedding flowers, but in particular roses, ranunculus, dahlias, proteas, peonies, freesias and orchids. If you like a strategy that is somewhat different to the norm and does not necessarily follow traditional marriage protocol, you will love succulents, after all what bride when deciding on her wedding florals can say no to a delectable, fat plant that is anything but boring!